Otherwise known as BETTER LATE THAN NEVER! Okay. So I'm late again. But this recipe is definitely worth the wait. Quick. Easy. And pretty tasty too. I think my orange must have been juicier than most as the juice ran all over the pan creating quite a sticky mess but all in all, the flavor was terrific. The orange flavor added an interesting note to the apple and cinnamon flavor. Using the puff pastry really made this dish go together quickly. The only thing I would do differently is to fill the turnovers a bit more next time. I didn't use all the filling mixture. The turnovers seemed plump before baking but but flattened out a lot during the cooking process. 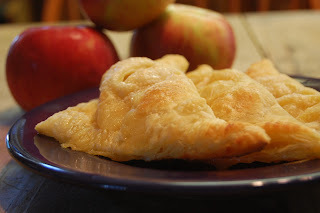 Next time I'd probably slice the apples instead of dice them and really load the filling in there. I didn't this time because if I added more, my dough tore. Next time I will do a more vigilant job of keeping my dough chilled and see if that helps. Thanks to Anne at Anne Strawberry for the great Barefoot Bloggers Bonus Recipe pick. Check out all the other Barefoot Blogger results here. These look delicious! Thanks for the tips on how much to fill them. I bet I'd've done exactly the same thing as you.